Granulomatosis with polyangiitis (GPA) is an uncommon disease entity characterized by necrotizing granulomatous inflammation and pauci-immune vasculitis of predominantly medium and small vessels. It mainly effects the upper respiratory tract and the renal system. It rarely engulfs other systems like the eye and hearing apparatus. We hereby report an interesting case involving simultaneous involvement of bilateral central retinal artery and hearing loss as presenting illness in a case of GPA. Granulomatosis with polyangiitis (GPA), previously known as Wegener granulomatosis, is a lethal, uncommon multisystem autoimmune disorder of unknown etiology. Its pathognomonic features include necrotizing granulomatous inflammation and pauci-immune vasculitis in small and medium-sized vessel vessels. Ocular manifestations occur in almost 8% cases. Of all ocular manifestations, bilateral central retinal artery occlusion is very rare. We here report a case of GPA, presenting with acute onset vision loss due to bilateral central retinal artery occlusion (CRAO) and severe auditory impairment along with other manifestations. A 56-year-old female presented with a history of breathlessness associated with low-grade fever for past 9 months. 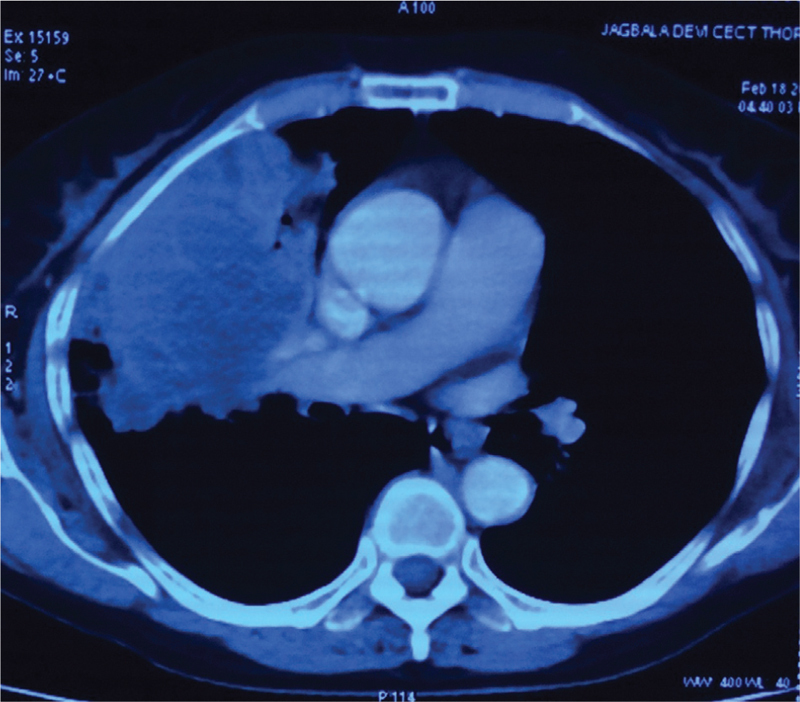 She was evaluated in a general medicine clinic where a computerised tomography (CT) thorax [Figure 1] was performed which revealed bilateral lung masses of various sizes. A CT-guided transthoracic biopsy showed presence of necrotizing granulomatous inflammation. [Acid Fast Bacilli (AFB) direct smear negative]. Based on the radiological and pathological findings, empirical antitubercular treatment was started by the physician. Patient did not improve and reported to the chest clinic. She was admitted for further workup. Examination findings: During the course of hospital stay, she developed acute onset bilateral visual and hearing loss. Vision was hand movements in both eyes. Her brain magnetic resonance imaging (MRI) was unremarkable except for bilateral maxillary sinusitis. Dilated fundoscopy demonstrated bilateral central retinal artery occlusion [Figure 2]. Pure tone audiogram revealed bilateral mixed hearing loss. Considering all clinical and pathological features, multisystem vasculitis was suspected, and further workup was initiated. Her serum electrolytes, renal parameters, and urine analysis were normal. Her erythrocyte sedimentation rate (ESR) was 120. Further serological tests demonstrated normal antinuclear antigen (ANA) and antiphospholipid antibody titers. Her serum was positive for cytoplasmic antineutrophil cytoplasmic antibody (ANCA, with a positive titer of 1/200). A diagnosis of GPA with involvement of bilateral paranasal sinuses, lungs, retinal arteries, and mixed (sensory neural and conductive) hearing impairment was made. As seen in other cases, renal involvement was not there. Patient was then initiated on immunosuppressive therapy with injection methylprednisolone (1 mg/kg/day). Her visual acuity and hearing loss improved significantly within 5 days of the therapy, objectively assessed on audiometry and visual acuity test. GPA is a multisystem disorder characterized pathologically by necrotizing vasculitis of small arteries and veins, commonly affecting the respiratory and renal systems. It is a potentially lethal disease, and early diagnosis and treatment with immunosuppresives are the key to decrease morbidity and mortality. The disorder is clinically diagnosed by the presence of two of the four criteria established by the American College of Rheumatology. The criteria include oral or nasal inflammation, abnormal chest radiograph, urinary sediments, and granulomatous inflammation on histopathology. The earliest complaints that lead patients to seek medical attention are generally due to respiratory tract involvement which can include sinus nasal and ear involvement. Ocular involvement may be the presenting feature in 8% to 16% of patients of GPA. Common ocular manifestations are scleritis, episcleritis, uveitis, orbital pseudotumor, nasolacrimal obstructions, fistulas, peripheral keratopathy and keratoconjunctivitis sicca, etc. Mechanisms by which visual loss occurs may result from vascular occlusions, macular edema, inflammatory destruction of retina, optic nerve, or corneoscleral tissue. There are a few cases of visual loss secondary to central retinal artery occlusion in GPA reported in the literature.,, Bilateral involvement of the central retinal artery as seen in our patient is unique and extremely rare, hence highlighting the impact of the extent of the disease process. The pathophysiology of retinal vasculitis in GPA remains largely unknown. Stimulatory autoantibodies may be involved in the pathogenesis, leading to neutrophils binding to the endothelium which can release mediators and cause injury to vessel walls. Our patient presented with involvement of both hearing and vision apparatus; hence, early recognition and management becomes a priority to minimize the morbidity associated with the findings. The ANCA titer, high ESR, and leukocytosis may help in diagnosis and may also parallel with the intensity of the disorder. Our patient too had significantly raised ANCA titer which helped us have confidence in our diagnosis which led to initiation of prompt and appropriate treatment. A clinical remission may be associated with reversal of ANCA titer to normal. Treatment of GPA with systemic manifestations revolves mainly around immunosuppressive therapy. Corticosteroids with cyclophosphamide have been commonly used for inducing remission and for extending life span of patients involved. The visual acuity as well as hearing loss improved with the introduction of corticosteroids in our patient. In four previous similar reports in literature with bilateral CRAO and GPA, patients had significant reversal in symptoms with management with corticosteroids/immunosuppressants.,,, The prognosis of GPA has greatly improved with the understanding of disease process and introduction of immunosuppresives; however, there is still significant morbidity associated with the residual disease and side effects of the therapy.The prognosis with ocular involvement depends upon the chronicity, time to remission, number of relapses, and severity of the eye involvement and is good if recognized and treated early with immunosuppressives. 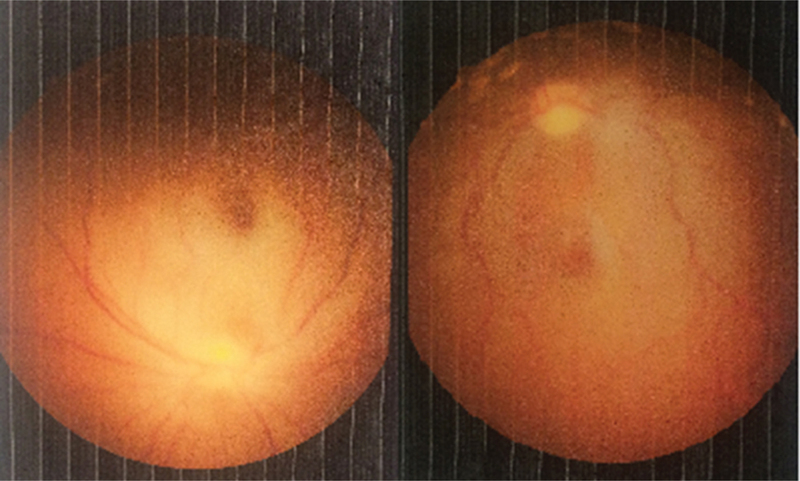 On the introduction of steroid therapy, our patient showed significant improvement in her auditory and ocular functions/hearing and vision ability. The constellation of findings in our patient like bilateral involvement of central retinal artery, bilateral mixed hearing loss, sinusitis, and lung lesions make the case unique. Connecting the dots, which started from finding granulomatous inflammation in biopsy to recognizing multisystem manifestation including eyes and ear involvement, leads to early diagnosis and prompt treatment. The importance of vision and hearing loss proved to be a boon for the patient as early treatment with corticosteroids could lead to the reversal of vision and hearing loss which could have severely impacted the quality of life of the patient. Eye and ear involvement in GPA has been described with a variety of manifestations, but simultaneous severe functional loss due to CRAO and mixed hearing loss as a presenting manifestation makes this a unique case worth presenting in medical literature and a learning lesson about the gravity of this disease. Aviña-Zubieta JA, Mai A, Amiri N, Dehghan N, Ann Tan J, Sayre EC et al. Risk of myocardial infarction and stroke in patients with granulomatosis with polyangiitis (Wegener’s): A population-based study. Arthritis Rheumatol 2016;68:2752-9. Kubaisi B, Abu Samra K, Foster CS. Granulomatosis with polyangiitis (Wegener’s disease): An updated review of ocular disease manifestations. Intractable Rare Dis Res 2016;5:61-9. Lamprecht P, Lerin-Lozano C, Reinhold-Keller E, Nölle B, Gross WL. Retinal artery occlusion in Wegener’s granulomatosis. Rheumatology 2000;39:928-9. Mizra S, Raghu Ram AR, Bowling BS, Nessim M. Central retinal artery occlusion and bilateral choroidal infarcts in Wegener’s granulomatosis. Eye 1999;13:374-6. Wong SC, Boyce RL, Dowd TC, Fordham JN. Bilateral central retinal artery occlusion in Wegener’s granulomatosis and α1 antitrypsin deficiency. Br J Ophthalmol 2002;86:476. Haynes BF, Fishman ML, Fauci AS, Wolff SM. The ocular manifestations of Wegener’s granulomatosis. Fifteen years experience and review of the literature. Am J Med 1977;63:131-41. Kelley JM, Edberg JC, Kimberly RP. Wegener’s granulomatosis: A model of auto-antibodies in mucosal autoimmunity. Clin Immunol 2010;134:104-12. Greenberger MH. Central retinal artery closure in Wegener’s granulomatosis. Am J Ophthalmol 1967;63:515-6. Holle JU, Voigt C, Both M, Holl-Ulrich K, Nölle B, Laudien M et al. Orbital masses in granulomatosis with polyangiitis are associated with a refractory course and a high burden of local damage. Rheumatology 2013;52:875-82.